Plant small flowers to brighten your windowsill, or herbs to add fresh flavour to home-cooked meals. A drainage hole and saucer ensure soil maintains the perfect moisture balance. 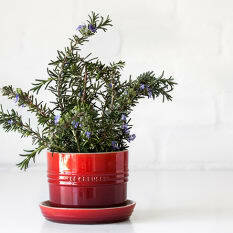 View more from Planters, Indoor Herb Planters & Keepers, Garden Planters, Le Creuset Homeware. Love it so much! Absolute beautiful addition to my collection. I purchased this item for my mom as a birthday present. She (like me) is a huge Le Creuset fan. This little planter is the perfect addition to her collection, and looks great on the kitchen window sill. I can't wait to get one for myself. Bought two of these for my orchids. They work very well. Herbs look so good in these! I love these herb planters. Just the right size, look lovely and are great for annual herbs like parsley, basil and coriander. Looks great on the windowsill with the coriander happily growing!